Chalet Chardons ski and snowboard hotels and chalets in Tignes are situated 100 metres from the piste in the beautiful and historic village of Tignes Les Brévières in the French Alps, giving direct access to the world-famous Espace Killy ski and snowboard area. 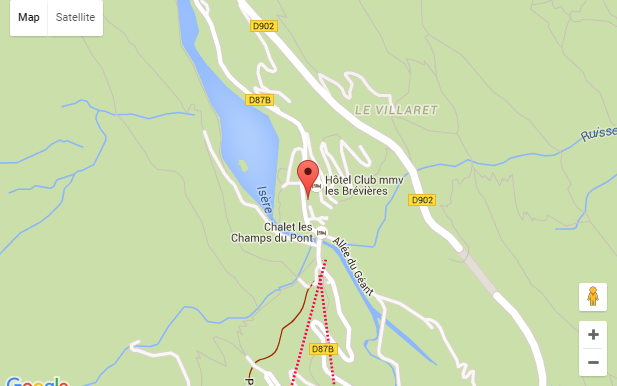 Our chalet in Val d’Isere is situated right next to the Fornet cable car at the other end of the Espace Killy. We pride ourselves on our simple yet comfortable hotel accommodation for skiing and snowboarding and our quality, excellently catered ski chalets at the higher-end of the market. We concentrate on producing excellent quality food with the emphasis on plentiful portions, a relaxed atmosphere and good company at the dinner table. If you are looking for a ski and snowboard hotel or chalet in France in an excellent resort at reasonable prices, please contact us using the details below. You can contact us in the UK Office year round on 01600 800 300 (UK local rate call). This is our dedicated bookings line for cheap bookings and enquiries. During the ski and snowboard season it is also possible to contact us directly in the hotel in Tignes. The UK Office is staffed all year around but there is nobody in the Tignes hotel from April 30th till December the 1st so please do not leave messages or send faxes then. Deal with the UK Office during this period. Please use the BOOKINGS number for any reservations or enquiries. PLEASE LEAVE A MESSAGE if phoning the office as we WILL get back to you. The phone will redirect to a mobile if nobody is in the office but if another call is being answered the system will go to voicemail. We will call back as soon as someone is available.